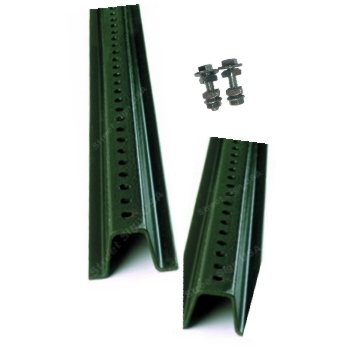 This post kit is designed for safety & versatility. Post breaks away from stub upon impact. The 8ft. heavy duty 2lb per foot steel U Channel sign post comes with a green baked enamel painted finish to resist rust and weathering for years to come. Holes are 3/8" in diameter are are punched 1" on center the entire length of the post which aligns to and fits all signs we sell. Stub is tapered on one end for easy ground installation. Dimensions Are Given in Appx. Installation Tip: 3ft. stub should be no more than 4" above ground. Hardware (included) for attaching 8ft top post should be spaced no more than 4" apart. The 8ft Break Away Post Kit is an excellent choice for all your long term permanent installations for small to medium size signs. The kit allows you to obtain a true 8 foot height above ground and can ship UPS on small quantity orders! Ideal for use in cemented or paved areas as well. If post needs to be replaced, a new one can be installed onto the existing stub. Kit includes 3ft stub, 8ft top post & 3/8" hardware to mount stub to post. The 2lb per foot U Channel post kit works with both our econo & heavy-duty street name sign brackets! This item ships via motor freight or courier within 1-3 business days!